How to Grow Ginger | Grow This! Ginger is an excellent herb with tons of culinary uses and numerous health benefits. Sometimes called Chinese ginger, it’s technically the rhizomes (not the roots) of the ginger plant that are harvested (and planted) to make common ginger. Ginger is so easy to grow you can plant them, forget about them until harvest, plant again and forget about them until the next harvest. It’s a beautiful cycle. Here are some easy instructions on how to grow ginger at home. Ginger should be planted in late spring and grown through the warmer months of summer but not fully harvested for 8-12 months. For short growing seasons, ginger should be started indoors and transferred outside when temperatures reach at least 70° F. Soil temperatures should be greater than 68° F before planting or transplanting ginger plants. Ideal temperature when planting is about 77° F.
Ginger is best grown in regions with hot, humid summers. They prefer to be grown in at least partial shade with some filtered sunlight, though full shade is best. They should be planted in an area free of tree roots or other underground obstructions. Ginger plants are also vulnerable to strong winds. In cooler climates, ginger can be grown indoors and transferred outside for the hottest part of summer but should then be brought back in for winter. For this reason, ginger can be great for container gardening. Use at least a 14″ pot for 3 rhizomes. Sandy and loamy soils are best for growing ginger. Be sure the soil is thoroughly tilled and emptied of any rocks, roots, twigs or other obstructions that may hinder the development of the ginger root. Excellent drainage is also key. Soil pH should be between 5.5 and 6.5. Add lots of mature compost and organic matter, especially to heavier, clay soils before trying to grow ginger. If you plant in rich, fertile soil, you won’t have to worry about them much until harvest. 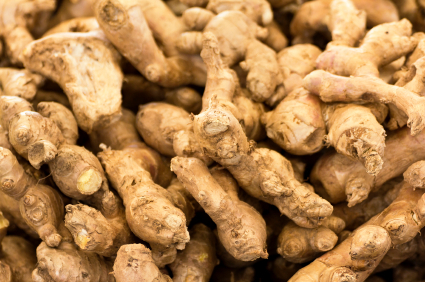 Ginger is grown from the same rhizomes (or root cuttings) you purchase at the grocery store. Be sure to purchase organic ginger or from a local farmer’s market or reputable source to ensure that you start with ginger that hasn’t been treated with chemicals that can inhibit its growth. Use fresh ginger only. Be sure the rhizomes are not shrunken, wrinkled or dried out. Fat, firm and aromatic ginger with lots of buds (eyes) works best. Soak the rhizomes in hot water overnight before planting. This will help to stimulate germination, particularly with store-bought ginger, which may have been treated with growth retardants. Cut each rhizome into 1-2 inch pieces. Each piece should have at least 1 eye or bud, but 3 or more eyes will have the best results. Bury each piece of ginger rhizome 1 inch deep and 8-15 inches apart. Be sure at least one of the eyes is facing up. You can also plant the whole rhizome as is, but you will likely yield less fresh ginger as a result. Ginger likes consistently moist soil but will rot if left in soggy conditions for too long. Water just before the soil dries out completely. Reduce watering at the end of the summer and as temperatures begin to cool. You won’t need to water at all the last 2 months or so before harvest. Ginger needs a dry period to properly develop. Use mulch thickly to maintain warmth and moisture in the soil and to fight weeds. Mulch is necessary if leaving rhizomes in the ground into the winter months, particularly in cooler regions. If you grow your ginger in rich soil, you won’t have to fertilize at all. Add a good layer of mature compost at the beginning of each growing cycle and you should be good to go until the following year. Ginger needs 3-4 months to mature before even beginning to harvest. You can only sparingly harvest at this time. Carefully remove the dirt to reach individual fingers of the rhizome, leaving the vast majority of each root intact in the ground. Main harvest only after the plant’s foliage dies. This may take 8-10 months or more from planting. Harvest as much as need. Put at least one piece of ginger back in the ground for each plant you wish to grow for the next year’s harvest. Ginger should not be grown near or in rotation with peppers, tomatoes or eggplant. Ginger will not tolerate temperatures below 50° F.
In cooler climates, ginger is grown mostly as an ornamental plant and you will not get much of a yield. Depending on your climate, you may not be able to keep ginger alive over winter outdoors. Try using lots of mulch to help survive the winter but you may need to grow it in containers that you can bring indoors once temperatures begin to get too cold. Do you have tips on how to grow ginger? Let us know in the comments section below. Copyright © 2017 GrowThis.com. All rights reserved. GrowThis.com is a participant in the Amazon Services LLC Associates Program, an affiliate advertising program designed to provide a means for sites to earn advertising fees by advertising and linking to amazon.com.